To help us provide for the poorest of the poor. Hands Together has attained an exceptional 4-star rating for demonstrating strong financial health and commitment to accountability and transparency. 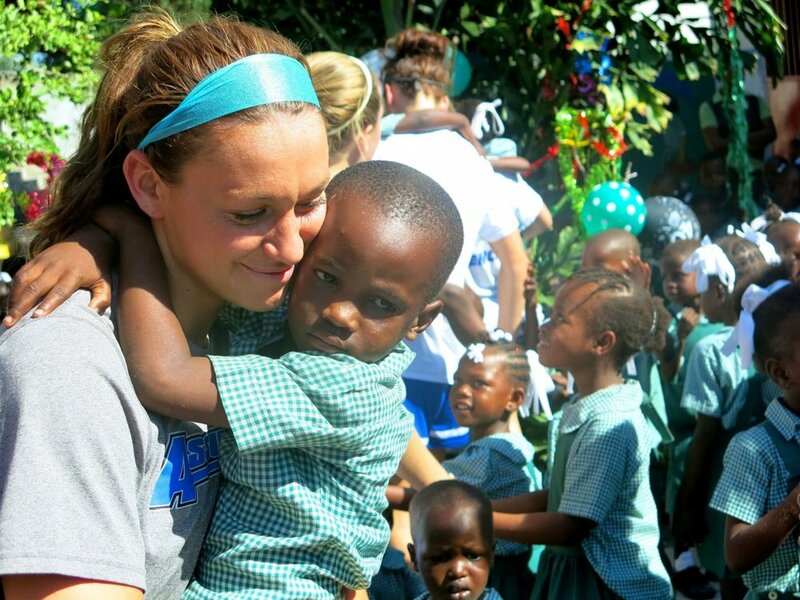 Here is a comprehensive look at what we do in Haiti. A big thank you to Karl Holtsnider, Ken Buckowski & the Mission Haiti team at Holy Family for putting this video together. Special thanks to award winning journalist Colleen Williams for narrating! Join us in restoring the forests of Haiti by donating a tree. 98% of land in Haiti has no trees which leads to soil erosion and flooding. Our students have been planting close to 100,000 trees and we want to plant more in Port-au-Prince at our 7 school campuses where trees are desperately needed. Your donation of $10 provides a seedling and the materials to care for and nurture the tree. Click button below for more information. Thank you! To read HT's Annual Appeal Booklet: click on BOOKLET COVER below. If your church or group would like extra copies to share please Click Here. Thank you! HT'S 2018 NEW YEAR APPEAL has been sent to our donors and friends. It has been a few years since we sent out an appeal booklet due to rapid growth and the various challenges that accompanied that, as well as ongoing crises in Haiti. Thank you to all of our donors and friends for your kind support! Hands Together has been working alongside the very poor for over 25 years, providing hope and strength to the most destitute and violent areas of Haiti. Our work is founded upon the Catholic teaching that recognizes the dignity of every human life and a fundamental responsibility to the poor and vulnerable. All of our outreach programs are Haitian-run, with generous financial and material support coming from very special people, parishes and groups. Hands Together feeds 25,000 people each month through our schools and elderly programs. "This is to state that I, Archbishop Eugene M. Nugent, Apostolic Nuncio in Haiti, do hereby recommend the work being carried out by Rev. Fr. Tom Hagan O.S.F.S, Mr. Doug Campbell, Executive Director and co-Founder as well as their associates who form Hands Together, a Catholic Missions charity in Haiti which is active in the poorest and most deprived areas of Port au Prince, Cap Haitien and Gonaives Dioceses. I have been able to appreciate at first hand the wonderful work being done by Fr. Hagan and his team in very difficult circumstances and often in situations where their own lives are in danger. I can also vouch for the transparent way in which funds have been used so as to benefit the maximum number of people and in a way that addresses their real needs." A Symphony of Hope is a collaboration by 25 of today's leading Oscar, Tony, Grammy and Emmy winning composers inspired by the friendship between film composer Christopher Lennertz and Father Tom Hagan, founder of Hands Together. HT brought aid to the areas of Jeremie and Les Cayes affected by Hurricane Matthew to provide critical care to the hardest hit areas where people were in desperate need of shelter, food, and water. Fr. Tom, Doug and HT staff worked with the Missionary Sisters of Charity and local parishes to provide food, water, and building supplies to help those displaced by the storm. October 2018 issue of Fairfield County Catholic - Serving the Poor: Everybody has at least one mission. Check out this article (p. 21) featuring Vince Santilli, a great friend to HT, mission appeal speaker & CEO of Homes for the Brave. Hope you enjoy this video, beautifully produced by Eric Porter and set to music by HT's own Jimmy Belabre, of the visit of Assumption College women's soccer team to HT for our special Christmas celebration and the inauguration of the new soccer field.